Forget about learning how to spell his name, Calgarians in 1985 didn't even want to know Joe Nieuwendyk. To them, he was simply the East Coaster out of Cornell that the Flames drafted with the second-round pick they acquired in the Kent Nilsson-to-Minnesota trade. Nilsson was one of the most recognizable players in Calgary and a two-time 100-point guy. Nieuwendyk was a nobody from Ontario. "That was the original thing, how can they trade Kent Nilsson, a 100-point guy, for Joe who?" Nieuwendyk told NHL.com. "That was the headline in the (Calgary Herald) the next day, 'Joe Who?' That's how I first started in Calgary. But once I got playing and had success my first year, they didn't write that stuff anymore." Today they're writing about a Hall of Fame career that began in Alberta's most populated city. Nieuwendyk, who is currently the general manager of the Dallas Stars, will be enshrined into the Hockey Hall of Fame on Monday along with Ed Belfour, Doug Gilmour and Mark Howe. He received enough votes from the 18-member selection committee to be inducted in his second year of eligibility. 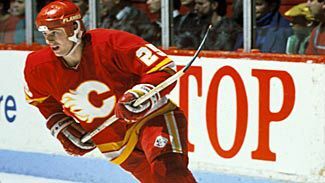 Nieuwendyk made Flames fans forget about Nilsson with his 51 goals and 92 points as a rookie in 1987-88. He had another 51 goals the following season and helped the Flames win their only Stanley Cup championship. He went on to win the Cup with Dallas in 1999 and New Jersey in 2003, finishing his career in 2006 with 564 goals and 562 assists for 1,126 points in 1,257 regular-season games over nearly 19 years with the Flames, Stars, Devils, Maple Leafs and Panthers. "You figured out quickly that you better learn how to pronounce his name because this guy was going to be prolific," NHL Network analyst Craig Button, who was the Stars' director of scouting when they acquired Nieuwendyk in 1995, told NHL.com. "There were points in time during his rookie season when you had to be like, 'Uh oh, we better get to know who this guy is.'" The hockey world got to know Nieuwendyk early in his career. He was the Calder Trophy winner in 1988 and a Cup champion in 1989. Terry Crisp, who was the Flames' coach in Nieuwendyk's first three seasons, got to know him better than most. He said Nieuwendyk was mature well beyond his 21 years when he arrived in Calgary fresh off of playing three seasons at Cornell. "Whenever you talked to him, whether it was at a practice, in your office, or just off-handed, he was always on top of what he was doing," Crisp, who is now a color commentator for Predators games, told NHL.com. "You never saw Joe being frivolous. He had a good sense of humor, but he was always focused. You just knew Nieuwy was on the ball. He always had it together." Nieuwendyk would argue that there were times early in his career that it may have appeared he was totally in control, but in fact he didn't totally understand what was happening. For instance, there was the time when Calgary won the Cup in '89. "I'm a 22-year-old kid and I probably didn't appreciate everything that was going on at the time," Nieuwendyk said. "The thing I remember most is what it meant to some of the guys that were on our team like Lanny McDonald, Jim Peplinski -- the older guys -- because they had been at it for so long and never got a sniff, and then ultimately they won. Seeing what it meant for them was good for me to see at 22 years of age. If not, I could have thought I was going to do that every year." It took him 10 years to get back to the Cup Final. Nieuwendyk wound up as the Conn Smythe Trophy winner with 21 points in 23 games to help the Stars win the championship in six games over Buffalo in 1999. "I was lucky that I had a Cup (in 1989), but I went 10 years without getting close again, so when I went through it in '99 I savored every moment," Nieuwendyk said. "I remember so much of that run in '99. That's when you realize how hard it is to get there. I cherished every moment of it." But let's rewind to 1995, when Nieuwendyk, then the captain in Calgary, realized the face of his team was changing with the departures of so many of his close friends, including Al MacInnis, Mike Vernon and Gary Suter. "It was a very difficult time," Nieuwendyk said. "The team we had was kind of breaking up." Nieuwendyk didn't stick around, either. Unhappy with his contract situation, he held out until the Flames eventually traded him to Dallas on Dec. 19, 1995. In return, Dallas gave Calgary one of its top prospects, a player by the name of Jarome Iginla. The Stars were thrilled. The Flames, of course, have been quite satisfied with Iginla as well. "We took a real hard look at our conference, and staring us in the face was Detroit with Yzerman and Fedorov, and Colorado with Sakic and Forsberg. We had Mike Modano, and that's really the only center we had," Button said. "We said if we are going to become a better team we said we have to pursue players like (Nieuwendyk). He was a winner, a player who had been a top performer in the League and he was at the right age. It was really fortuitous for us that Joe was in that (contract) situation." Nieuwendyk, though, was still unsettled with his new situation in Dallas, a market that still hadn't established itself yet in the NHL. "It was very unlike Calgary, where people in the organization and around the city seemed to live and die with wins and losses," Nieuwendyk said. "It didn't have that feel in Dallas. It was a market that was relatively new to hockey. We weren't selling out and we weren't a very good team. I have to be honest, I was very nervous." The Stars finished with only 66 points in Nieuwendyk's first season. They had 104 in his second and won the Presidents' Trophy with 109 in his third. But Nieuwendyk tore the ACL in his right knee in the first game of the 1998 Stanley Cup Playoffs and the Stars lost to Detroit in the Western Conference Finals. After having reconstructive surgery on both of his knees (his left ACL had been injured eight years earlier) Nieuwendyk stayed in Texas all summer and worked outside in the blistering heat with Dallas strength coach J.J. McQueen. "We did some kooky things, threw some tires around on the concrete, and on the field in the grass," Nieuwendyk said. "It was very disappointing to get hurt in the playoffs that year because we had a good team, but I think in some ways it drove me to be ready for the following year." Other than run the workouts, McQueen's job was to manage Nieuwendyk's temptation to do more. "You usually go through your program and do what you do, but he was like, 'Is that all we're going to do? We need to do more here, don't we?'" McQueen, who still works for the Stars, told NHL.com. "You wanted to make sure you weren't stepping out of bounds, but that was Joe. It's true for his character. "He was very enthusiastic, and he was back maybe six weeks before we thought he'd be ready." Nieuwendyk had 55 points in 67 games before being the MVP in Dallas' Cup run. "What he did to our franchise in Dallas took our team in a direction of excellence," Button said. "There is not a lot of pomp and circumstance to him, just a whole lot of substance." The Stars, though, started going through a transformation not long after losing to the Devils in the 2000 Stanley Cup Final. They won the Pacific Division in 2000-01, but Brett Hull left for Detroit the following season and the Stars started changing around Mike Modano, leading to Nieuwendyk and Jamie Langenbrunner getting dealt to New Jersey. Nieuwendyk wound up winning his third Cup with the Devils in 2003, but he had to sit out the entire seven-game Final with a torn oblique muscle. He nevertheless made a huge imprint on the Devils in his short time in New Jersey. "He brought both tangibles and intangibles," Devils GM and Hockey Hall of Fame member Lou Lamoriello told NHL.com. "Certainly (the tangibles were) the quality player he was even at that time, how good he was defensively as well as always finding a way to get big goals. It was also about how good he was on faceoffs. And the intangibles, which are really more tangible than anything, are what he brought in the locker room from leadership and unselfishness. It was obvious that when he didn't play he was still so active in his support. He's genuine in every sense of the word. He was a true team player." Nieuwendyk played for Toronto in 2003-04 and sat out the 2004-05 season altogether, opting against playing overseas during the work stoppage. He went to Florida with his close friend, Gary Roberts, in 2005 and lasted one full season and part of another before his beleaguered back got the better of him. He retired on Dec. 6, 2006. "I was OK with it," he said of coming to terms with the end of his playing career. "My first year in Florida I missed the first 15 or 16 games because of my back, but then I came back and played the last 65 games and I felt really good. I felt like I skated better than I had in years, but the following year the back issue came back again. There were a lot of mornings when I couldn't get my socks on. It was a challenge for me to get on the ice. "I had no regrets. The game was great to me and I felt like I gave it all I had until the end."